We can hold sessions for you in one of our indoor or outdoor venues, or we can come to you. 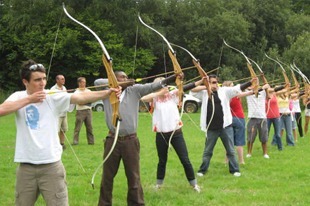 We have all the archery equipment and safety equipment. If we come to your venue a pre session visit will be required. Risk assessments can be delivered and our fully comprehensive insurance can be seen. Whilst numbers are not a major issue to us, value for money is!! so best to keep the groups to 12/15. We can organise food and refreshments for your group at our venues from plain sandwiches to a buffet to a full hot meal.